BAYSVILLE, ON – Lake of Bays Brewing has revealed details of the next beer it will be releasing as part of its partnership deal with the NHL Alumni Association, following last month’s debut of the flagship Top Shelf Lager. 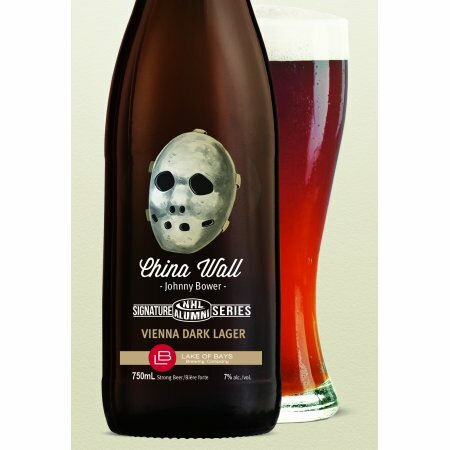 Kicking off the limited edition NHL Alumni Signature Series will be China Wall Vienna Dark Lager, a 7% abv and 33 IBU amber lager named after the nickname of legendary Toronto Maple Leafs goaltender Johnny Bower. Lovely reddish amber, auburn hue capped by ivory foam that reveals a complex beer underneath. Aromas include toffee, vanilla, mild coffee, mocha and almond. These initial notes are also accompanied by darker fruits like dates and figs and a wisp of strawberry The body is equally as complex with toffee, toasted whole wheat and chestnuts leading the way. The flavours are smooth and soft and end with a quick finish and a hint of mocha at the end. China Wall will be officially launched on January 18th 2014 – a date that also happens to be Hockey Day in Canada – with an event at the Summerhill LCBO in Toronto where Johnny Bower will be in attendance to meet fans and sign bottles of the beer. Pricing and distribution details for China Wall have yet to be announced.